Burgundy is back this year and you can see it everywhere…in wedding blogs, social media, and maybe, just maybe, in your wedding. This berry-hued, deep jewel color could match a wide range of colors from blush, grey, rose, gold to green, and much, much more. And this season, just the classic burgundy and white wedding color scheme provides a rich base for wedding palettes. This hot wedding color combo creates a vintage and elegant look and also shows a hint of modern. Here are some burgundy and white wedding ideas that may have you to rethink your wedding colors. Touches of burgundy and white do not have to be limited to your clothing and flowers. When incorporating burgundy into your wedding, work it in to your linens, jewelry, and accent pieces to your table scape and your favors. Even the smallest touch of burgundy will go a long way. Burgundy is an easy color to incorporate in your flowers. Whether you choose burgundy, white, and greens -OR- you want to add in a pop color like blush or fall tones, the base of your floral being burgundy will make a huge impact on your wedding day. When you think of a wedding cake most people tend to see a white frosted, tiered cake. With that white base it makes burgundy accents pop even more, but don’t be afraid to go for the gusto and have a burgundy cake or accent just a single layer in that color. Burgundy is a beautiful color on all skin tones (yes, even you beautiful redheads can pull this off). If you have a lot of bridesmaids you can also put some girls in blush tones to visually break it up. If you are wearing a white or ivory dress, you are sure to stand out standing next to your girls. Wedding guests love to get a glimpse of what’s going on for your wedding and the thing they are most fascinated with is the color scheme of the wedding. 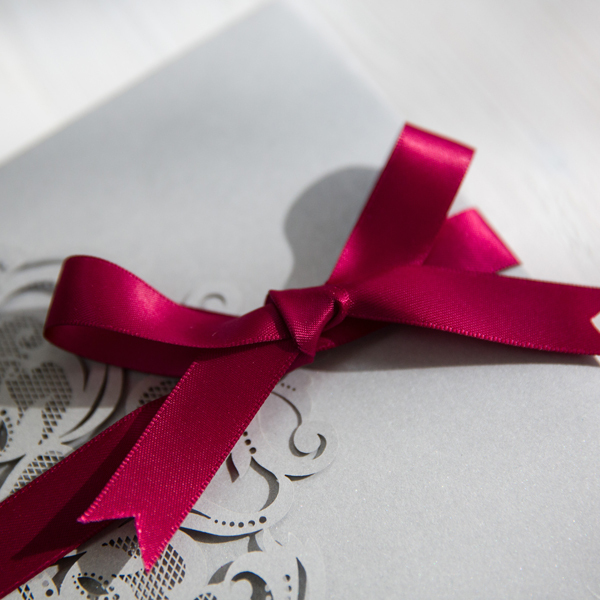 Our invitations are certain to get that point across that your fabulous wedding is burgundy and whatever other color (or not) your imagination decides to pair it with. Currently a new pretty laser cut wedding invite design is available at stylishwedd.com. 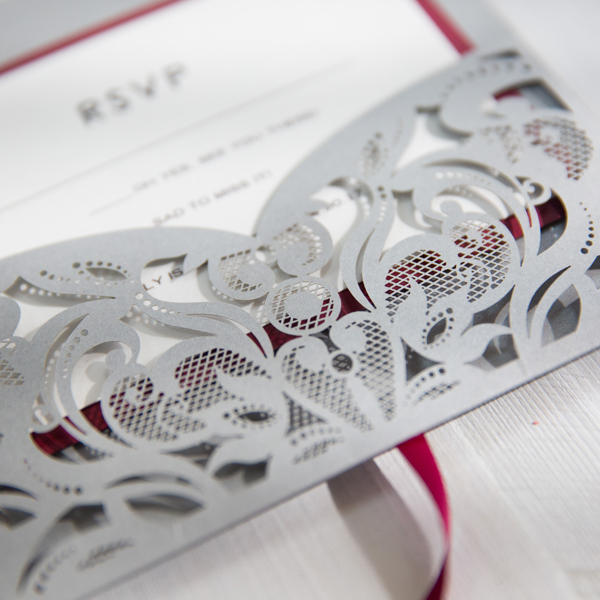 This laser cut invitation really struck me with the intricate, modern designs. 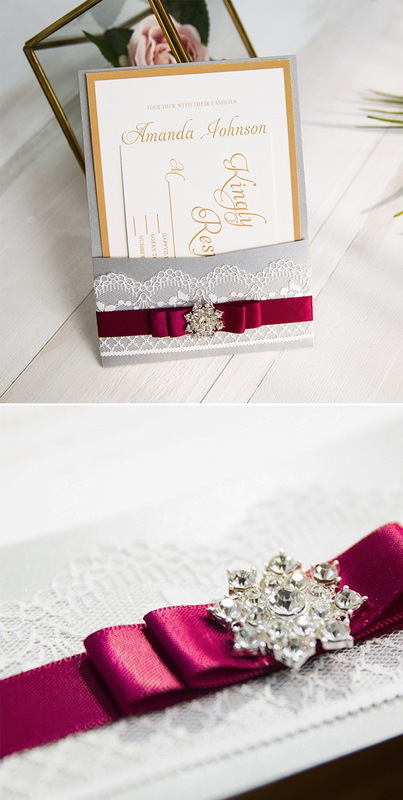 Elegant gray laser cut wrap design, delicate inside-pocket style for RSVP card, finished with a burgundy satin ribbon bow, this pure luxury wedding invitation from Stylishwedd would be ideal for your elegant wedding day. 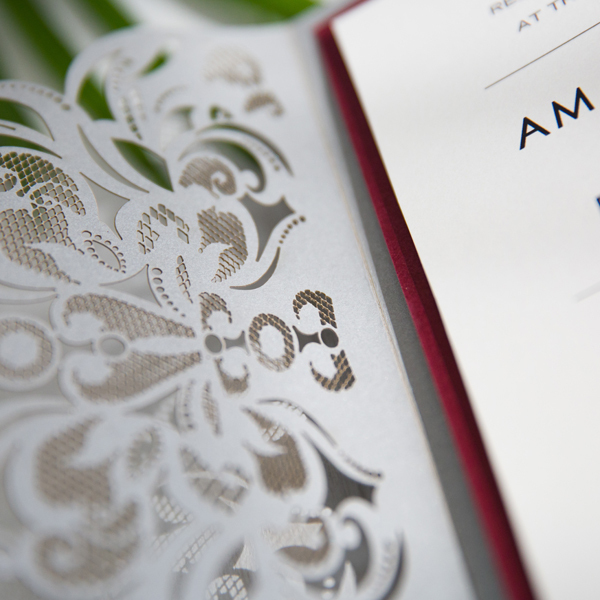 Wow your guests with this stunning impressive laser cut wedding invitation. Oh, one important thing: If you are not sure how to decorate your wedding to match this glamorous wedding invitation, scroll down and I will show you several wedding décor ideas for your inspiration. Burgundy or marsala is cool rich color that is perfect for fall and winter seasons, and It looks very lush and noble with gold accents. This contrasting combo is perfect for any type of décor and for your outfits. Burgundy and gold can be adapted to modern, fine art, vintage and other types of weddings. Get inspired by these six burgundy and gold color palette ideas for your big day! 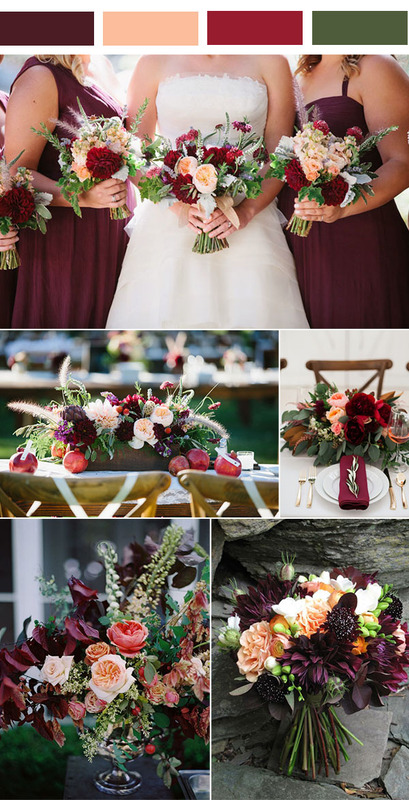 Burgundy and peach is one of the favorite color palettes for fall and winter weddings. It’s contrasting and bold and makes any wedding sophisticated and outstanding. If not for a theme color, Burgundy and peach also works perfectly as complimentary hues to your wedding decoration. I’ve prepared a whole bunch of amazing ideas to incorporate them in your wedding. Get inspired and be super trendy in your 2017 weddings!